Yes that’s right; Valentine’s Day is on a Sunday this year! We had the most successful Valentine’s Day feast at our restaurant in 2015, since we opened in 2009. This year, it is a Sunday, which is why we are opening from 12:30 to 4 pm and then again for a special evening service that is intimate, candlelit and romantic from 6 till 11 pm. It is a great opportunity for you to treat your Valentine to a special meal, a time to remember for years to come! We do not believe in jacked up prices for a limited set menu on special occasions, therefore we are still serving our usual 3 course meal ‘Culinary Selection’ at the regular price of £16.95 that no other restaurant can beat in value or quality. Due to the reduction of our table numbers (ie, tables of four will be two), our numbers are reduced to nearly half of what we would usually seat and we only have one sitting, both for lunch and dinner. It is already proving popular, therefore give us a ring to book your table before all of them are booked. Aubergines baked in clay oven, cooled down and finely chopped, then rubbed in salt n pepper and garlic. Afterwards folded into yogurt and garnished with cumin. Our famous unleavened bread, baked in a clay oven at extremely high temperatures, this is the most delicious flat bread that you have ever tasted, ideal for dipping in this course! Fesenjan, also known as khoresht-e fesenjan, is special occasion Persian food.Traditionally, it was made with duck or pheasant, in the north, in the province of Gilan (its swamps being the nesting place for the wild ducks, along the Caspian Sea). I have done this with chicken! Once you taste it, you will dream about it at night! 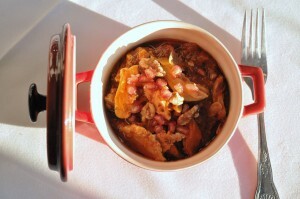 A thick and naturally sweet and sour dish cooked with pomegranate juice, tomatoes, onions, walnuts and flaked almonds. 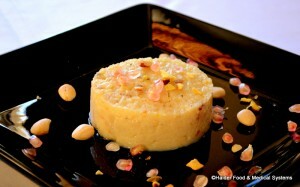 The almonds are another one of my personal touches to this great dish! 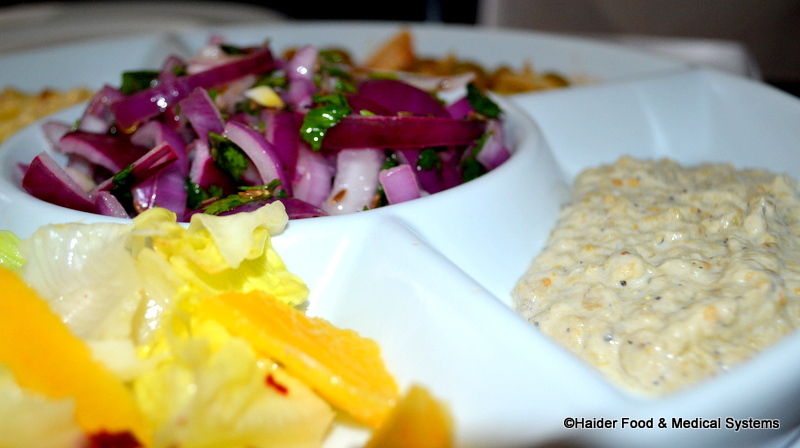 Not only is this my favorite Persian dish, but it will soon become yours, too! Simply delicious! A rich and spicy lamb curry that apparently dates back to the late 1560′s, during the reign of Akbar the Great (one of the Moughal rulers). Moughals transferred the Persian literature and culture to India, thus forming the base for the Indo-Persian culture; hence the North Indian connection with my restaurant! Cubes of lamb are cooked until tender and succulent in onions, garlic, ginger, cumin, cardamom, cloves, coriander powder and salt to taste. An absolute delight for meat eaters! My North Indian selection: Fairly spicy, this very special vegetarian dish is simply delicious and unlike anything you might have tried before. Cooked with just onions, garlic, whole grain mustard, fenugreek, cracked pepper and salt, it tastes scrumptious! 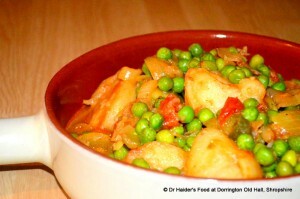 The delectable award winning chicken curry that won me the Shropshire Curry Chef of the Year. Cooked with onions, tomatoes, clay oven roasted peppers, fresh ginger, garlic, green chilli, cumin, cloves, fennel seeds, cinnamon, salt and cracked black pepper. Also written and pronounced Qormeh Sabzi, this is the latest addition to my menu. It is a traditional and very popular Persian dish, served when family members return home after being away. 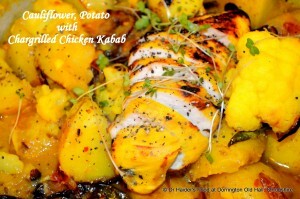 It is deliciously savoury and loaded with the flavours of several different green herbs. I have omitted the meat and have used Rose coco beans (peas is my addition! ), spinach, onions, fenugreek, parsley and sun dried limes! It is traditionally served atop Pollo (rice), but very pleasant and very comforting with nan, too. 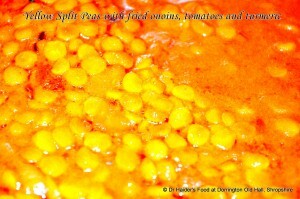 Lentils have finally shaken their image as a fattening “poor man’s” legume and have even become somewhat glam! Khoresht is a Persian stew – usually with a meat and lentils. 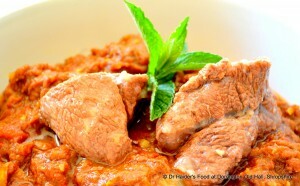 Again, I have left the meat out of this dish in order to make it extremely versatile but still very delectable, indeed. 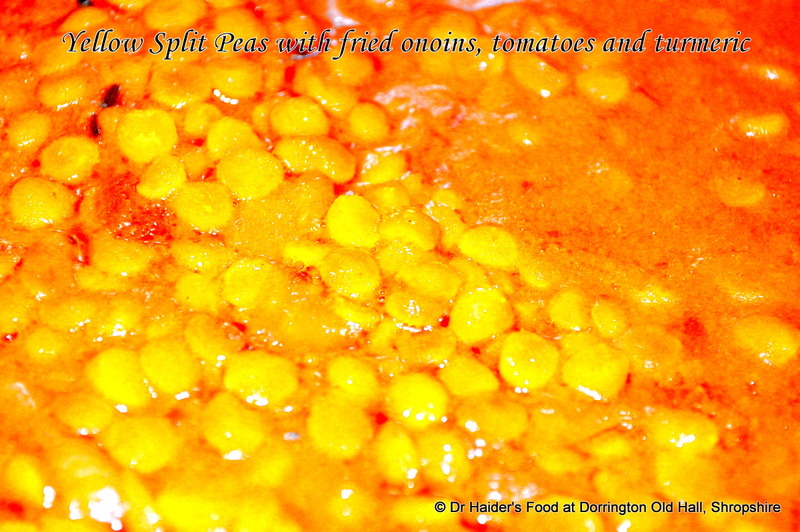 Yellow split peas are cooked with onions, tomatoes, sun dried limes and fresh lime juice giving it the lip-smacking quality! Non vegetarians; Do not thrust aside this dish! Murgh means chicken. I use the breast meat, leg and thigh meat and butterfly it open, after removing the bone. Thereafter I marinade it in grated onions, oil, salt and pepper with a few chili flakes as well as some cumin and leave it overnight. Probably not so Persian, this has been a very popular dish since its introduction, on my menu. 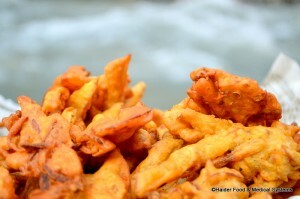 It is cooked with onions, ginger and salt to taste, garnished with fresh ginger julienne. Prepared for the evening. Literally meaning vegetable and white rice. 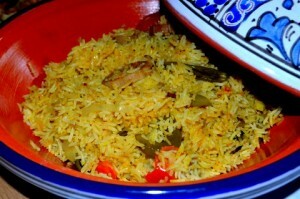 Aromatic Basmati rice steamed with veg and fruit like grapes, sultanas, plums and even apples and pineapples. And whatever I find on the the day; all thrown in and heated with a bit of oil, salt and pepper, rather than fried. Again plainly basic but flavoursome. One of my few signature dishes, in Persian means fried fish.River cobbler (a freshwater fish with a moist and meaty texture), seasoned and marinated in salt, Carom seeds, lemon juice, pepper – both black and red, in a light tempura like batter. 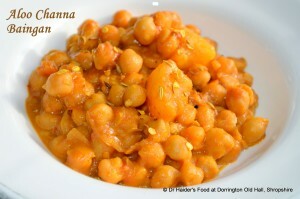 Moist, luscious and plainly delicious! A must try one! Oh this is just scrumptious! Aged old very rare and special basmati rice cooked with an array of spices, including green & brown cardamom, cumin, cloves, cinnamon sticks, black peppers, bay leaves, whole coriander seeds, fennel seeds, fried julienne carrots, golden sultanas and chickpeas. This is something you haven’t tasted before! Apparently comes from the very north of when it was Great Persia that included Armenia and Azerbaijan; hence the alternative name Russian Salad. I still call it by its real name – Salad Oliveih. Cold chicken with apple, pineapple, carrots, white cabbage, boiled potatoes and eggs, all folded in our mayonnaise and a touch of cream. No spice but still yummy! Ground Basmati rice, plain whole milk, sugar, cardamom, floral extracts and honey. Set and chilled with golden sultanas. Another sweet dish imported by the Moughals. Persian word for Mongol is “Mughal,” from which we get the English word, “mogul,” meaning “tycoon”. Traditionally, this dish is served in the Indian Subcontinent on the special occasion of Eid, twice a year. It is here for you enjoy whenever you would like to! Made with vermicelli, plain whole milk, honey/sugar. sultanas, dates and floral extracts. Divine! All delicately sweetened and aromatic. All that for a modest £16.95 per person; ideal way to spend your Valentine’s Day! Please ring 01743 719 100 or book here.